Radiacwash™ Spray Mist combines the power and economy of Radiacwash™ with the convenience of aerosols. 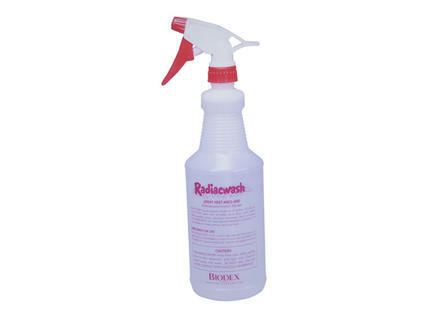 Radiacwash™ Spray Mist is a Radiacwash™ Solution packed into a special high pressure mist applicator. When the activator is depressed, over 200 lb of pressure is created at the nozzle. The pressure misting effect allows Radiacwash™ to penetrate around and under contaminants and lift them off the surface into solution to be wiped up and disposed. Radiacwash™ has been used extensively in hospitals, universities, laboratories and reactor facilities since 1951. It is the first and most popular general purpose decontamination solution specifically created for the fast and safe removal of the entire spectrum of nuclidic radioactivity. Radiacwash™ is a concentrated solution designed to rapidly control radioactive contamination and remove radioactive particles from surfaces by a two-way action. First, it will sequester metallic ions which contaminate surfaces. Second, it lifts up and firmly suspends the contaminating particles, allowing contamination to be rinsed away with hard, soft or salt water. Radiacwash™ will remove general laboratory contaminants such as soil, grease, oil, blood, resides, resins, and tissue and can be used safely on all surfaces, either straight or diluted, including skin, cloth, all metals, glass, floors, walls, leather, rubber, porcelain, plastic, laboratory instruments, utensils and equipment. Radiacwash™ is a synergic liquid compound that optimally combines a number of different chemical and physical principles causing it to act as a surface-wetting sequestering agent, chelater, carrier, ion-exchanger, emulsifier, solvent, complexer, peptizer and detergent. Radiacwash™ has a pH of 5, less than .008% Halides, contains no phosphates, chromates, silicates, enzymes, borates, aluminates, carbonates, and inert fillers that can interfere with sensitive analytical procedures. Radiacwash™ is non-alkaline, non-corrosive, and biodegradable.